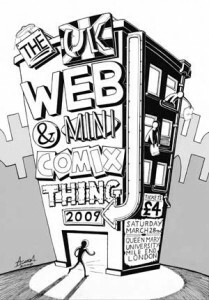 The Thing is a web & mini comics convention that happens every year in the UK – and it’s on tomorrow, Saturday the 28th of March at 10am – 5pm in London. You are going right? This will be my first ever comics convention and I’m really excited! I know a few of the people attending from online but nothing beats meeting someone face-to-face. I haven’t got a booth – to be honest I wouldn’t know what to do with one – so I’ll be the person floating around with a sketchbook randomly molesting artists. To make myself recognisable to anyone specifically seeking me out I will be wearing fairy wings. Got that? Yes, it’s random and not related to Epic Fail in the least, but they are really easy to spot! So no excuses for not saying hello! I’m going to set up twitter on my phone and send updates of what I’m doing throughout the day. I’m hoping to have lots of fun!